My name is Huriye Huhammed. I am 35 years old, I have two children aged 4 and 6, and I am also pregnant. Our family consists of 12 people. I am the second wife of my husband, and we are all living together. 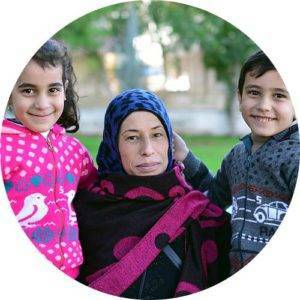 When I was in Syria, I was a housewife, and our living condition then was fine. We had a car and a home, but the war destroyed everything. We fled our home, carrying only our clothes, whilst under the shelling of the artillery and airstrikes. We decided to leave Syria because of the airstrikes, lack of food, lack of medication, and fear. I am from the city of Homs, and it was under siege for 6 years. We have not seen our families in Syria for 6 years; we only contact them by phone. This work is covering our rental and some of our needs, and I hope this work will continue. We lost our homes in Syria, and we pray that the war would end and we could return to our country. I want to thank Martta and I wish her all the best.